**LAST PLOT REMAINING** PART EXCHANGE CONSIDERED. We have great pleasure in offering to the market three stunning individual contemporary family orientated homes, currently under construction and due for completion July 2019, created by a highly regarded local company Newlynn Homes in association with HTC Construction Limited. THE FIRST THREE PLOTS ARE ALREADY SOLD prior to completion with Plot 3 the last chance to acquire one of these superb homes. When complete the properties will be finished to a high specification, designed with a great deal of thought and attention to detail with contemporary fixtures and fittings and excellent detail. 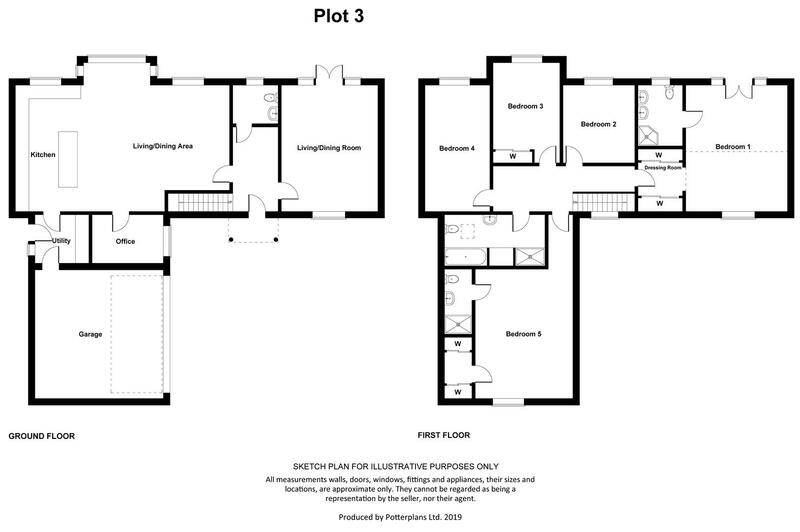 Each property will offer five bedrooms and two receptions excluding a substantial open plan living/dining kitchen which will undoubtedly become the hub of the home, benefitting from a southerly aspect with walk-in bay window and bi-fold doors leading out into a garden generous by modern standards, overlooking open fields. In addition from an initial entrance hall will be a useful cloakroom, utility room, home office and a dual aspect sitting room with French doors leading out into the rear garden. To the first floor, four of the five bedrooms will have far reaching outlooks to the rear and two will have ensuite facilities, plus a separate family bathroom. In addition the properties will enjoy a generous level of off road parking with double garages having electric doors. Internally the properties will be finished to a high specification with all carpets and floor coverings included, branded integrated appliances, oak internal doors, gas fired central heating with underfloor heating to the ground floor and contemporary bathrooms, and when complete will create a stunning family orientated home within this small Vale of Belvoir hamlet. The properties will benefit from a 10 year Protek warranty and buyers could have input into some of the final internal finishes depending on the build stage at the time. The village is well placed for commuting to local towns and cities via excellent road links and is only a few miles away from the well serviced market town of Bingham with its wealth of amenities and facilities.